Is it rational to believe that God can literally communicate with us humans in a way that we can understand? Stephen Covey masterfully answers this question in the affirmative. God can and does communicate with us His children. We just need to learn how to listen and Dr. Covey teaches us how. Good morning, my dear brothers and sisters. I invite your participation with me today during this devotional. How many of you have experienced confusion in your life regarding how prayers are being answered? By that I mean what voice is speaking to you? How many have been confused with regard to the difference between the Spirit of Jesus Christ and the Holy Ghost? I believe that one of Satan’s main thrusts to destroy the Lord’s kingdom and his children would be to give to them a wrong conception, a wrong understanding in their minds regarding these matters. If I had a wrong or an inaccurate map of the city of Provo, and I wanted to find a particular destination, I would inevitably be lost. Not that I am not in the right territory, but that I have the wrong map or the wrong understanding of the territory. I wouldn’t really know where I was or where the place was that I intended to go. I believe that this has taken place with many people in our Church with regard to the subject of revelation and the functions of the Holy Ghost as differentiated from the functions of the Spirit of Jesus Christ. I was very interested in President Lee’s and President Kimball’s first press conference after they were made Presidents of the Church. The basic message which they gave to the world and to the Church was to keep the commandments. Keep the commandments. And, of course, if we study the messages of all of the prophets, that seems to be the burden of those messages . What would this mean in light of this subject focusing upon the role of the Spirit of Christ and the role of the Holy Ghost? Let’s first examine the meaning of this message from the point of view of nonmembers of the Church. It seems that this message would have application for them: Keep the commandments. What are the commandments that they are familiar with? They are at least familiar with those in the Judeo-Christian tradition. They have received the Ten Commandments, and most of the laws of Western civilization are based upon those Ten Commandments. We are told in modern revelation that if people will follow the light that they have been given, it will lead them to the covenant gospel. Let me quote from section 84 of our Doctrine and Covenants: “And the Spirit giveth light to every man that cometh into the world, that hearkeneth to the voice of the Spirit” (D&C 84:46). The Spirit of Jesus Christ is given to every person coming into the world, and particularly it will be manifested in those who have received the laws of God given through ancient prophets, particularly the Ten Commandments. “And every one that hearkeneth to the voice of the Spirit cometh unto God, even the Father. And the Father teacheth him of the covenant” (D&C 84:47–48). In other words, if people outside this Church will keep the Ten Commandments and follow their consciences, they will be led to the covenant gospel. Then when they enter into the covenant relationship with the Lord, they receive the gift of the Holy Ghost. They become members of his church and kingdom. For those who then are members of the Church and kingdom, what are the commandments of the Lord? They would comprise the Ten Commandments and the basic laws of the land. The Ten Commandments would be the predicate or the foundation for those laws. Plus, they would keep the covenants they have entered into in the ordinances of the gospel, the promises they have made which would give them a more educated conscience. They are more fully aware than anyone outside the kingdom of who they are and what their mission and role in life are and who God is and the role and mission of the Savior. That is a higher understanding, and it places, therefore, a greater responsibility or burden on them. They have a more educated conscience. They are more convicted by a feeling of guilt if they violate certain covenants of which the world is not even aware. In addition to these general commandments and these Church principles and ordinances which apply to all members of the Church, they have the Holy Ghost. If they truly receive it, the Holy Ghost will give to them personal commandments. President Lee’s and President Kimball’s counsel to “keep the commandments” is such a distillation expression, because those who are not members of the Church will receive not only the general commandments which the world has received, but also the ordinances and principles of the gospel applicable to all members of the Church and, in addition, personal commandments from the Holy Ghost, giving guidance and direction in all of the activities and the affairs of their life. Their conscience is more educated than ever. They’re educated regarding the world’s enlightenment and the Church’s basic principles and doctrines, all of which is revelation—general revelation. But they are also educated with regard to personal revelation, personal commandments regarding each individual stewardship. We have been told many times by the Brethren words to this effect, that you and I as members of the Church have the same right to personal guidance and revelation in our area of jurisdiction, our stewardship, as the President of the Church has in his stewardship. From this we learn that the Light of Christ is the creative and governing power for all things in this universe and for all of God’s creations. It is everywhere present. What is really the power and spirit of God, we call the Light of Jesus Christ, and if it were to be withdrawn from us we would lose our life immediately. Moses experienced a time of a partial withdrawal, and he fell to the earth and for the space of many hours he did not even have his natural strength and he proclaimed: “Now . . . I know that man is nothing, which thing I never had supposed” (Moses 1:10). I believe that what the scientist calls nature is the Spirit of Jesus Christ. I believe that what the Catholic and Protestant worlds call God is the Spirit of Jesus Christ. And perhaps this is what all religions call God. It is everywhere present; it can dwell in a man’s heart. I believe that what the humanist would call decency and what the man on the street would call common sense is the Spirit of Jesus Christ. We all are partakers of the Spirit. The civilized world has the Spirit of Jesus Christ; and if the people obey it, they will be led to the covenant gospel probably through members of the Church and missionaries. They will pray in their own ways. I’ll never forget the great impression I had in the Irish Mission when I wrote to new converts to obtain an understanding of their background and their conversion process. It was almost universal that they had been praying in some way or hungering in some way, not necessarily in our way but in some way they were hurting and desiring something more, and many of them were trying to be truer to their consciences. They were being prepared by the Spirit of the Lord. 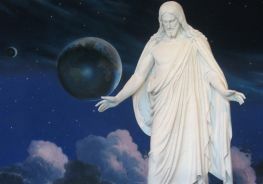 Elder Bruce R. McConkie in a message to institute and seminary people on this campus several years ago used this physical illustration to distinguish between the Spirit of Jesus Christ and the Holy Ghost. It was very instructive and impressive to me. He said, “The Spirit of the Holy Ghost could be compared to a radio transmitter; you and I, to the radio receivers. The radio waves would be the Spirit of Jesus Christ.” This physical symbol illustrates the difference. The Holy Ghost is a member of the Godhead who performs very specific functions on this earth—to sanctify, to guide, to witness, to testify of the Father and Son and things pertaining to their kingdom, and to confirm the promise of the Father when you and I enter into a covenant relationship in the waters of baptism. When we renew our covenants in other ordinances the Holy Ghost confirms the promise of the Father to us, his covenant children, that if we will live true we will have peace in this world and eternal life in the world to come. The Holy Ghost then would give us guidance, personal revelation, and personal commandments regarding the affairs of our lives. President McKay taught that to all members of the Church who are in the line of their duty the Holy Ghost normally speaks through their consciences. The Lord may choose many ways to speak, but it seems that the still, small voice, the enlightened conscience, or heart within a person would be the natural one for him to choose. However, it may require some other way to reach a man who is perhaps beyond the experience or the words of Christ which have been deposited within that conscience, or it may require the imposition of keys, priesthood powers, or certain other special blessings. The choice would lie in the Lord’s hands according to his purposes. But for most of us most of the time the Holy Ghost will speak through our consciences. The Spirit of Jesus Christ is the medium through which the Holy Ghost, this member of the Godhead, performs his unique and special functions (see Moroni 10). I would like to ask four questions and ask you to ponder carefully the answers to these questions in your heart, your conscience. The still, small voice will give to you an inward awareness of these questions. You won’t hear a voice in your ear. You’ll feel it; you’ll sense it. There’s an awareness, particularly if you have educated your conscience through the teachings of the Church and prayer and scripture study. First question: What do I need to do to draw closer to the living Christ? Can we pause for a few seconds and seriously consider the answer from our consciences to that question? What do I need to do to draw closer to the living Christ? Second question: What do I need to do to be a better member of my family? Think about your particular role: father, mother, son daughter, brother, sister. Third question: What do I need to do to more fully magnify my Church membership and callings? If you are a male member who holds the priesthood, ask yourself what you can do to magnify your priesthood? Really listen and sense what your conscience is saying to you. Final question: What do I need to do to more fully magnify my stewardship as a student here at Brigham Young University or as a faculty person or staff person, whatever role it may be? How many here can honestly acknowledge that you know many things that perhaps you need to do in these categories? How many would also acknowledge that if you and I were to really do these things, marvelous results would take place in our lives. Why do we wait? What are we waiting for? I really believe that what we sensed within ourselves today is personal revelation. Our conscience is the repository of all that divine education, and if we really are still and listen to the answers to those kinds of questions which to me are the prioritized stewardships of our life, we will get this guidance. If an angel of the Lord were to come into this devotional assembly today and stand in the air, clothed in power and glory, and give to each of us the same messages that we have received from the still, small voice within, what would we think of that experience? I’m sure we’d be terribly impressed and perhaps go to our death beds testifying of it when constrained to do so. Yet I believe in a sense that that which you and I have received is of a higher order of revelation, less dramatic, but of a higher order of revelation than if an angel of the Lord from the other world were to give to us these messages. Angels minister by the power of the Aaronic Priesthood. The Holy Ghost ministers by the power of the Melchizedek Priesthood. Jesus said to his disciples, “More blessed are those who believe and have not seen than those who believe and have seen” (see John 20:29). The Prophet Joseph once told a man who was critical of himself because he hadn’t come out of the waters of baptism prophesying and speaking in tongues as someone else had: “You had more believing blood.” He elucidated the point that those who are of the blood of Israel will often experience less dramatic physical kinds of manifestations than those who are being adopted into the blood. I believe sometimes that as Latter-day Saints we are like fish who discover water last. We are so immersed in the element that we are unaware of its presence. We have been immersed in the revelations of the Lord in this dispensation. No dispensation can compare to this one. The level of light and knowledge about man’s true nature, our mission, and the full scope of ordinances that can be performed for the living and the dead in the temples of the Lord transcend that which has been given to any other dispensation. In a sense this is a dispensation of the Holy Ghost. We don’t experience the personal ministry of the Savior in our presence, but that isn’t as great as the Holy Ghost. The Savior even said to his disciples, “It’s necessary that I must go or the Holy Ghost will not come” (see John 16:7). You can imagine their feeling about that because every time the Savior would leave they would fall apart and desert him. There wasn’t one disciple that did not fall away—including, as we know, the chief disciple, Peter. But before he did finally leave them after his resurrection, he breathed on them and said, “Receive the Holy Ghost” (see Acts 1:5–8). It’s possible to be given a gift and receive not that gift. They prayed, the scripture says. They stayed together and fellowshipped each other, read the words of the scriptures, and remembered the words of their Savior. Then on the day of Pentecost the Holy Ghost came like cloven tongues of fire. Then the real conversion processes, under the influence of the gifts of the Spirit, changed these otherwise weak men into indefatigable disciples, champions of the truth right to their martyrs’ deaths. Nephi became so sensitive to the still, small voice that he could dialogue with it when he was commanded to slay Laban. He had such familiarity with that voice through long obedience that he knew it was the Lord’s voice. Laman and Lemuel had no familiarity with it. It required an angel to come to them and to shake them. The message had to break into their sensory world so that their senses could recognize what had happened. They were not changed before nor after the appearance of the angel. I believe many people in our Church are often “looking beyond the mark,” looking for some more mystical, dramatic, mysterious manifestation, and they may be denying all the while the true spirit of revelation of the Holy Ghost to their own souls. I spoke at a devotional a couple of years ago at Ricks College, and a girl came up afterwards and said, “Brother Covey, what is the difference between a heartburn and a burning in the heart?” She was really asking, “How do I really know how God answers prayers? How do I know it’s not just me projecting my own wish and want onto God, feeling good about it, and calling it his answer?” That’s what she was asking, and I believe many of us have asked that question of ourselves. “I can’t believe the difference in my life once I started to realize that the Holy Ghost is my own guide if I will listen to him. I can receive personal guidance and revelation, and as long as I am true to it all things will work together for my good.” She bore her testimony. There was no confusion in her mind anymore. President Lee spoke to a group of missionaries in England, and in answer to the question “What is the most important of all the commandments?” said, “The most important commandment is the one you’re having the greatest difficulty living.” You can see why. If a person would be true to the whispering of that still, small voice regarding some of those matters that you and I just heard, other things would happen. Many people who want to have answers to big decisions or intellectual dilemmas in their minds, but who are not really open and receptive to the whisperings of the Spirit in their hearts, will continue to remain confused in their minds. The principle is this: If you’re confused about a matter, be true to that which you know is right, and in the Lord’s time and according to his purposes you will be given enlightenment and understanding regarding the matter you were confused about. It may be a big decision or it may be an intellectual problem that you have on your mind. I tried to reason and indicate what would happen if one were to take poison, even if he were unaware of it, and how also if one violated the law of chastity he would suffer great consequences. He argued against this, indicating that this didn’t give the kind of freedom that a careful, mature, responsible love would give people. I prayed and remembered the scripture in Revelations, “Behold, I stand at the door, and knock: if any man will hear my voice, and open the door, I will come in to him and will sup with him, and he with me” (Revelations 3:20). So I asked them, “Would you listen for just a minute? Inwardly sense what might happen, what the real answer is to this question that we have tonight. I’ll ask a question, and you be still and listen. I’ll promise you, you will sense inwardly—you won’t hear it in your ear—that what I’ve been speaking about is true on this principle of chastity.” They became still. Some of them were looking around to see who was going to take it seriously. And I really pressed the point: “Just listen for one minute.” During that quiet minute I asked the question “Now, is chastity, as I have explained it tonight, a true principle or not?” Then I paused. At the end of a full minute, I turned to the fellow who had been the spokesman in front and I asked him, “My friend, in all honesty, what did you feel? What did you hear? He said, “I don’t know. I just don’t know any more.” One stood up in the back independently, spontaneously, on his own, and said, “I want to say something to my fraternity brothers that I’ve never said before. I believe in God.” And he sat down. A completely different spirit was present. It softened everybody. They were very interested in the restored gospel and in the Book of Mormon. We invited many to the institute of religion and gave some books out. The final question I’d like to look at for just a moment is this: How do you educate your conscience? I suggest five principles. First, if you really want an educated conscience, feast regularly upon the words and the love of Jesus Christ. What does that mean? Seriously make a daily program to study the scriptures. Ponder the scriptures and meditate upon them. Be still. Perhaps you will read only one verse a day, but you’re going to read the word of the Lord. Memorize some of the scriptures. It’s like programming a computer. Get them into your heart. If you feast upon the words of Christ, then the Holy Ghost will bring to your remembrance the things you need to do, based upon the guidance that you have received on a moment-by moment basis. The Church will teach us principles, and the Holy Ghost will teach us specific practices and specific applications. Second, when you pray, listen. Look on your prayers, not as a time to counsel the Lord, but as a time to take counsel from him. I really believe too many times we go down a checklist, in a sense, telling the Lord who, how, where, and when to bless and directing him around the universe and the heavens, instead of being still, sensing a relationship, listening, and then responding to what you hear. Feasting on the words and the love of Christ will instill the desire to listen. Fourth, keep the covenant. Keep the commitment. Fifth, return and report. Give an accounting of your stewardship. You will feel the still voice say within you, “I commend you for your integrity. Very good, my son or my daughter. This labor is acceptable.” Then you progress to the next level and the next level. If you have temptations toward impure thoughts, try these steps. Feast on the words and the love of Christ, then ask the Lord to give you a heightened awareness or sensitivity toward any tempting environments, and then commit to the Lord that the moment that sensitivity is given to you you will turn from it and do some worthy thing. Then keep your commitment. One student said to me, “All my mature life I’ve had trouble with bad thoughts—even during my mission. Whenever I was asked the question ’Are you morally clean?’ I answered yes because I was considering my practices. But I always had some plaguing feelings about my thoughts.” We were walking into a final examination one day when he said, “Brother Covey, I can look you in the eye today and say, ’I am morally clean, right to my core.’” What did he do? For a period of several months he feasted on the words of Christ, asked the Lord for a heightened awareness of temptation, turned immediately at the very first onset of that temptation and did worthy things, went back to his divine purposes and his work. Elder Packer said, “Hum a hymn. Memorize a scripture.” And this young man did it. The Holy Ghost. I believe, purged much of that other disposition right out of his nature. I express my testimony, dear brothers and sisters. With all my heart I believe that we are immersed in the revelations of the greatest dispensation, the restoration dispensation. I believe that we have available to us at any moment the whisperings of the still, small voice, the Holy Ghost, and that if we will take pains regularly to educate it and to train it, it will be a continuing source of personal revelation to us. My testimony is borne out of the Spirit of the living God to my soul. I know that this is true. I know that the Father and the Son appeared to the Prophet Joseph Smith and established the Church that teaches the gospel. I also know that it is possible to be active in the Church, in one sense at least, and not to be active in the gospel. To be active in the gospel is a continuous responsibility and stewardship of seeking and living by the Holy Spirit. I bear witness that you are God’s covenant children. We are all children of the promise. Our life is a mission, not a career. The Holy Ghost is to be used to bless all of our Father in heaven’s children. I testify also of Jesus Christ. I love the words: “I believe in Christ as I believe in the rising sun—not because I can see it, but because by it I can see everything else.” He is truly the life and the light of the world. He speaks to his prophet, President Kimball, and to each of us if we will but listen and educate our consciences. And I pray God that we will do so, in the sacred name of the Lord Jesus Christ. Amen. 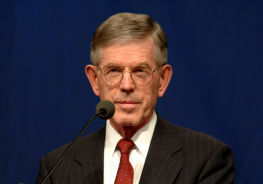 Stephen R. Covey was associate professor of organizational behavior and business management at Brigham Young University when this devotional address was given on 27 May 1975.